The Amateur Radio Service will be undergoing a transformation as personal computers bring the need for high speed digital communications into the ham shack. The modems now heard on the air will be woefully inadequate to provide bandwidth-efficient data transmission. This has led a number of amateurs to look into synchronous modulation techniques, and in particular, minimum-shift keying (MSK). MSK was first patented as a "Minimum-Shift Data Communication System" in March of 1961 by Melvin Doelz and Earl Heald of the Collins Radio Company. 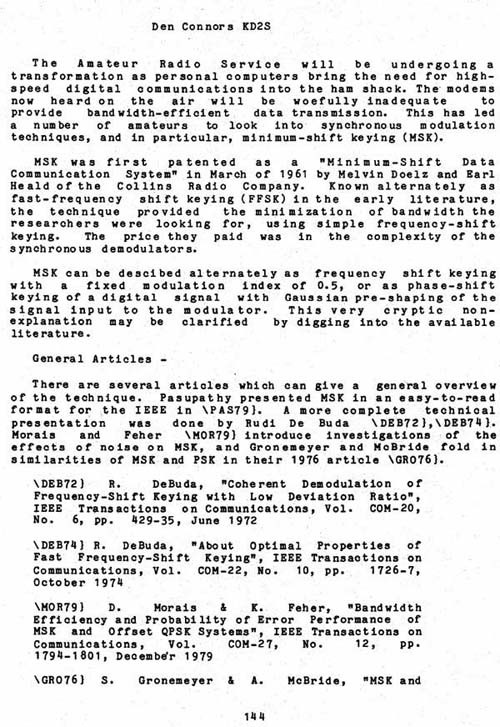 Known alternately as fast-frequency shift keying (FFSK) in the early literature, the technique provided the minimization of bandwidth the researchers were looking for, using simple frequency-shift keying. The price they paid was in the complexity of the synchronous demodulators. MSK can be described alternately as frequency shift keying with a fixed modulation index of 0.5, or as phase-shift keying of a digital signal with Gaussian pre-shaping of the signal input to the modulator. This very cryptic non-explanation	may	be	clarified	by digging into the available literature. There are several articles which can give a general overview of the technique. Pasupathy presented MSK in an easy-to-read format for the IEEE in \PAS79}. A more complete technical presentation was done by Rudi DeBuda \DEB72}9\DEB74}. Morais and Feher \MOR791 introduce investigations of the effects of noise on MSK, and Gronemeyer and McBride fold in similarities of MSK and PSK in their 1976 article \GR076}.